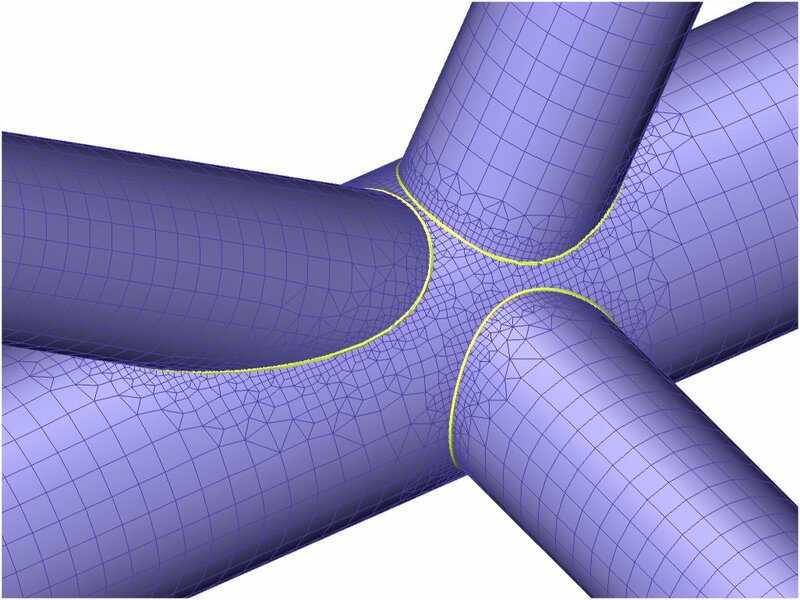 SCIA Engineer offers a very practical and powerful tool to handle intersecting shells of any shape. We will illustrate this below, on a joint at the intersection of 4 steel tubes. As each tube has been modeled independently, there is no connection between them at first. This connection can be easily created using the “Connect nodes/edges to members” command from the Geometrical manipulations toolbar or the “Intersection” command from the Structure service. Once the intersections have been created, the “Cut-Out” tool can be used to remove unwanted parts. In this case, we will remove only the penetrating parts. It would also be possible to create holes on the main tube in the same way. A basic mesh can then be generated with an average mesh size. One can see that the mesh nicely follows the intersections and is perfectly connected. In order to get accurate results where they matter most, it is possible, as a next step, to create local refinements along the intersections (Calculation, mesh > Local mesh refinements). In this example, the new “elastic mesh” was used in order to get a smooth transition between one mesh size and the other. We’re looking forward to your entries in this year’s User Contest!